I've used amla powder as a natural but it wasn't until my relaxed journey that I have been an avid user of cassia obovata and henna. Cassia Obovata generally has the same properties as henna, except it deposits a subtle gold colour on dark hair instead of a red/orangey one. Though I love using Ayurvedic herbs on my relaxed hair I hate how dry it leaves my hair no matter what I do to combat it. I love mixing my own recipes and adding different herbs together to make a great conditioner. Usually I would mix my cassia with a bit of henna. To combat dryness I would add coconut milk or yogurt and a bit of oil. The only problem is I still had dryness. So I decided to swap aloe for coconut milk and cut out the henna (to avoid the redness). I mixed all together until smooth and creamy and allowed it to sit for a few hours. Because I decided to make this in advance, I froze it and left it for a couple weeks. I store mine in an old yogurt container. 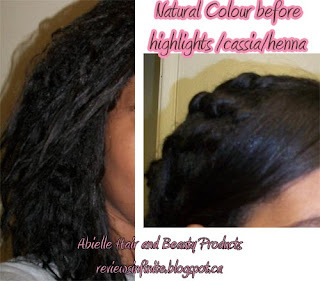 Applied cassia paste to dry hair in sections. Usually I would apply on damp, freshly washed hair. While washing out the cassia my hair did feel rough (dry?) but post-deep conditioning it felt pretty soft! I have no idea whether it was the steamer or the conditioner but I successfully combated the dryness I usually get. My hair seemed a much more vibrant, richer shade of brown. One thing I noticed is the cassia/hibiscus and henna really help to enhance the red undertones of my hair making my new growth blend better with my previously highlighted hair. I drew lines to indicate where the actual highlights are but I made a mistake. The highlights are about 2-3 inches lower than the lines. That's how well the cassia has made my colour blend! My hair was already in good condition so I didn't notice any strand thickening or significantly less breakage while combing. I was hoping for improvement here but I guess my hair would have to be much worse off to notice drastic change. So...my goals were half achieved I think. You must wash out as much of the paste from the hair as possible allowing for minimal to no residue left in the hair. 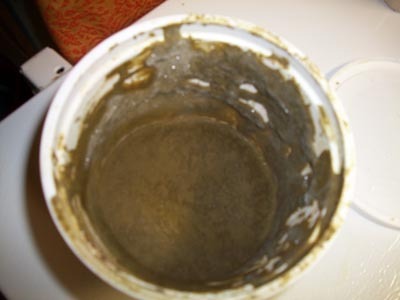 The residue left will leave the hair feeling dry afterwards no matter how much conditioning you do. I washed out the product pretty good but I never get all of it out because my hair is so thick and tangly by nature. It takes a few wash days to get it perfectly clean but the cleaner the better the end result. Make sure your hair is not "dried out" before using. My hair was in okay condition, neither overly moisturised or protein overloaded. Since my hair was pre-oiled and very soft from the hemp oil I think that helped offset some dryness. Usually I would use coconut oil and it has a tendency to make hair feel dry. Dry hair followed by drying herbs is a recipe for disaster. 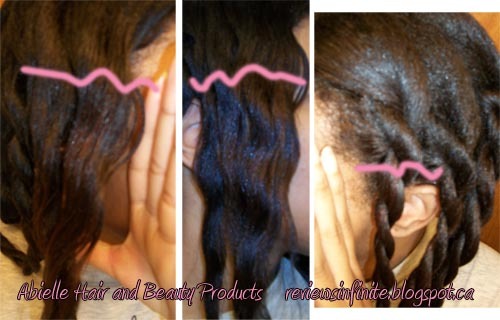 Deep-conditioning is extremely important and also the conditioner you use. My conditioner has no protein in it and I made sure I left it on long enough that it effectively moisturised my hair. I used to use Aubrey Honey Suckle Rose but on my hair, it has never been moisturising enough. I also never use a steamer although I'm not sure that is what made the difference here over the Bee Mine itself. Not leaving the cassia in too long. In my experience my hair does not like being wet forever and 4+ hour hair treatments make my strands weaker. I found applying the paste on dry hair prevents that "wetness" issue. On the flip side, if your hair is not covered and the cassia is allowed to dry (read: stick) onto your hair it will be pure hell to wash out. I am convinced that if my mixture was simply water+cassia, it would pretty much feel the same way. I think these 4 points are the real difference. Overall, I think cassia obovata is a great product that I will continue using for blendability and shine. You got very good results.